A PATCO train crosses the Benjamin Franklin Bridge from New Jersey headed to Pennsylvania. 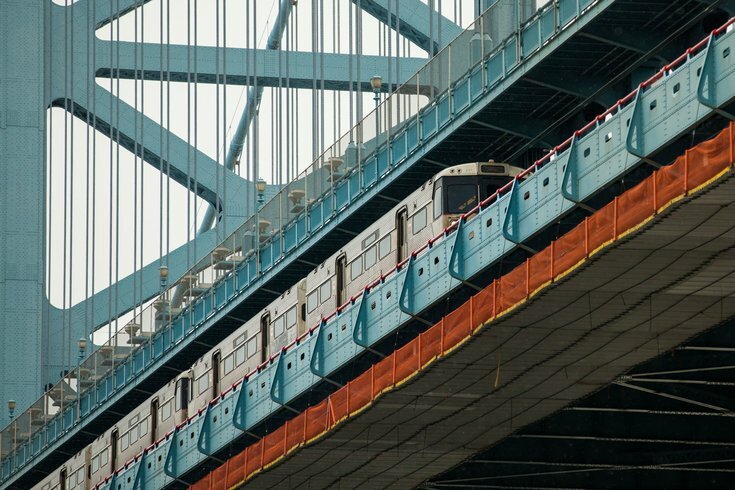 PATCO riders experienced delays Tuesday during the evening rush hour as an eastbound train on the Benjamin Franklin Bridge was halted due to "a mechanical defect," PATCO said. At about 6:16 p.m., PATCO tweeted that its train lines to and from South Jersey were experiencing a 15-20 minute delays due to the disabled train on the eastbound tracks and earlier that an "operator is work[ing] with staff on correcting" the problem. PLEASE NOTE: We have a 15-20 min delay in both directions due to a disabled train on the bridge. We are currently single tracking around it. Riders who took to social media to voice their frustration said a "rescue train" was en route to transfer passengers. 2 words you never want to hear on your @RidePATCO commute home: "Rescue Train"
@RidePATCO @PatcoWatchers Rescue train? Jesus take the wheel. Though, some riders did share one perk for us to enjoy while they begin their trek home: the view. A spokesperson for PATCO did not immediately return a phone call for more information Tuesday evening. This story is developing. Check back for details.